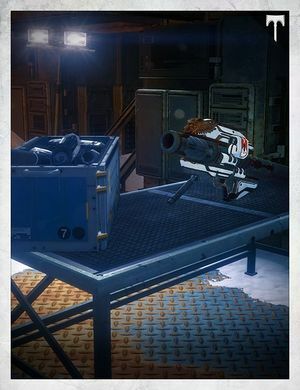 "Explore the past for hints to forge a new Gjallarhorn." A Symbol of Honor is a story mission in the Quest Beauty in Destruction, where The Guardian researches how to forge a new Gjallarhorn. TYRA: The tower now called Bannerfall is a standing monument, a relic of the City's more violent past. It was also home to the workshop Feizel Crux used to develop a weapon worthy of the Iron Lords. GHOST: Let's just hope some of his notes and prototype parts are still intact. The Crucible tends to be a little rough on the decor. The Guardian lands at Bannerfall. GHOST: We're here, Tyra. Any idea where we should start? TYRA: I have asked that full power be restored to the tower while you are there. You should be able to access Bannerfall's core database. GHOST: Got it. We'll let you know what we find. The Guardian finds the core database and lets their Ghost scan it. GHOST: The tower database has everything pretty clearly marked; I have locations for Feizel's workshop and the archives. Let's check the archives first. Tyra, how many towers like this are left? TYRA: At the City's height, the Titans held the Wall from eight towers along its length; most have been destroyed. The Guardian proceeds to the archives and lets their Ghost scan it. GHOST: This is the right area. Let's see what we can find. The Ghost looks through the archives. GHOST: Hmm... these are combat logs from New Monarchy's final assault on the Concordat. Still hard to believe a faction right here in the City would try to rise against the Speaker. This is some pretty incendiary propaganda from New Monarchy denouncing Lysander and the Concordat; glad I wasn't around in the City for this. The Ghost continues looking through the archives. GHOST: Aha, here we go. Feizel Crux's personal blueprint store; Gjallarhorn blueprints front and center. Let's head to his workshop next. The Guardian proceeds to Feizel's workshop. GHOST: These look like components for their "Royalty" line of launchers: Baron, Viceroy, Charlemagne... huh. This is a bunch of development materials from Lomar's work; I think some of these designs became the Truth launcher. This is it; these components match the notations on the Gjallarhorn blueprints. We've got what we need! Alarms begin to sound around Bannerfall. GHOST: Bannerfall's early warning systems are feeding me data. The Fallen are here. TYRA: I have sent word to the City's defenders. You will have aid soon, Guardian, but it may take some time to get there. GHOST: We can't let them take part of the Wall. Hmm... the turrets! If we can activate the automated defenses, we can hold the Fallen until the Hawks get here. The Guardian activates the turrets, which help to hold off the Fallen. GHOST: That's all we can do. I'm reading Fallen all around us. GHOST: (annoyed) Be fascinated later! Kinda busy! The Guardian takes out all the Fallen in the area. As they enter a Darkness Zone, a bomb appears on one side of Bannerfall. GHOST: I'm reading two massive explosive devices just transmatted in; the Fallen must be trying to breach the Wall. The Guardian approaches the bomb and lets their Ghost defuse it. GHOST: Let me at that thing! The Ghost begins to defuse the bomb. GHOST: I've got this. Just keep them off me! As the Ghost defuses the bomb, the Guardian defends it with numerous Dregs, Vandals, Captains, Shanks and even Servitors arriving to attack the Guardian. GHOST: (annoyed) I'm trying to defuse a bomb here, and those explosions are not helping! The Guardian continues to clear out the endless waves of Fallen around the area. Eventually, their Ghost successfully defuses the bomb. GHOST: That's one down; let's find the second before we have to explain to Zavala what happened to his wall. The Guardian and the Ghost locate the second bomb, and lets their Ghost defuse it. GHOST: You know the drill; we can do this! The Guardian continues to hold off the endless waves of Fallen until the bomb is defused. GHOST: That's it, we got it- we don't got it. I just registered a massive transmat; a Fallen Captain, and he's coming for us! At the center of Bannerfall, a massive Captain, Iliksis, Light Stalker, appears, along with rank and file of Fallen infantry. A Skiff is also present to provide support. Despite the overwhelming number of Fallen and the presence of air support, the Guardian manages to kill Iliksis. GHOST: ...okay. Now I think we've got it. TYRA: History will look well upon your actions here today, Guardian. Return to the Iron Temple; I'm eager to look at what you've found. This mission gives new information of Lysander and the Concordat's war with New Monarchy.